Turban garlics are a hardneck variety and early producers (first ones to be harvested). Large plump bulbs with 5-7 very large fat cloves. They mature more quickly than other garlics. 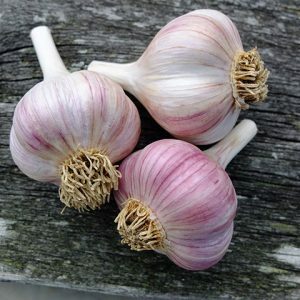 You need to watch this garlics closely and harvest them as soon as they start bulbing and you notice browning of the leaves, Turbans do well in hot and dry climates. Shorter storage life (3 to 5 months) but early producers.